The person behind one of our favorite YouTube discoveries on the world of singing wrestlers. 7" single artwork for Golden Pair's "Mystery Love"
MIND GAMES: Do you remember your first record? Nicholas: Records were sort of on their way out when I was a kid, so my mother gave me and my brother her old records. The first one I remember actually listening to was The Man Machine by Kraftwerk. It was just so different from all the other records. The album artwork was strange and in a foreign language, and the music was equally strange. I think I’ve spent the rest of musical life pursuing the “weirdness” that record had. Beyond The Wrestling Album and Piledriver, how did you discover that there’s a whole world of these other records made by wrestlers? What was the first wrestling-related disc you found? I found a picture disc of Fred Blassie’s “I Bite the Songs” album at a flea market. It was really interesting to me that they’d print such a high quality niche item, so I figured there’d be more and immediately began trying to find them. What is it about records made by wrestlers that is so interesting to you? So many wrestling records were vanity pressings (meaning self-published.) Those kind of records are always interesting because they don’t have to meet any company standards, and lack direction and influence outside of the original recording artist’s own. Someone took the effort to put a piece of music to wax on their own dime. I find it charming! You’ve posted some pretty obscure gems to your YouTube channel and some of them don’t have any info available online besides what you’ve posted. Do you know about these records before you come across them or are you hunting blindly? Many I do know about, but there’s always more that pop up and surprise me. I also have a large collection of old Japanese magazines and sports sheets, and often they’d report when a wrestler had released a record. Pro wrestling was more culturally relevant in Japan than the U.S., more akin to how pro football is treated here, so their coverage was much more serious. What has been the most surprising record you’ve heard so far? I was pleasantly surprised to hear Atsushi Onita has a beautiful singing voice. He’s such an emotional figure, it adds to his allure. Which stand out as your favorites? The joshi records are by far the best. 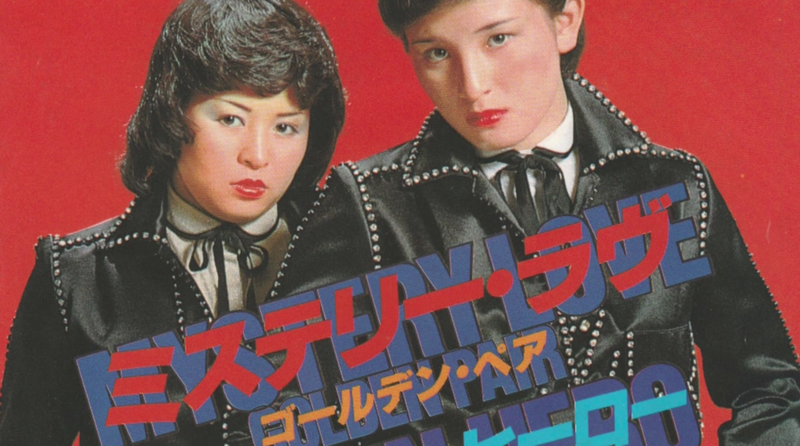 It’s sort of crossover of pro wrestling and idol culture, both were very popular in Japan at the time. The music and artwork are all great, some even include polaroid photos and comic books about the girls. I really feel the joshi wrestling crowds of the 1980s are comparable to Beatlemania. Thousands of young girls screaming for their favorite stars throughout their performance. It’s really something to see. How many of these records do you suspect don’t actually have the wrestlers performing on them? Some of the Japanese records are interesting in that they don’t have any music at all, but rather audio recordings of matches and interviews with analysts and wrestlers. I suspect they’re from a time before home video was available, so people would listen to the play by play of their favorite matches to relive them. It’s an amazing media relic [that] really reminds you how much we take for granted what’s available to us now. What is the most unlikely place you’ve found one of these records? Like I said, wrestling is more culturally relevant in Japan. I’ve been to several bars and restaurants where the owners would have pictures up of wrestlers who’d visited, flyers from big shows they’d attended, and at one shop I visited, the owner had Riki Choshu’s “Power Hall” 45 on display among other memorabilia. What type of records do you buy outside of the wrestling world? I used to have a crazy record collection; loads of old punk, new wave, heavy metal, jazz etc., but found the culture around collecting changing, and didn’t enjoy myself while doing it any longer. I downsized and kept the records I still found fun like the Wendy’s “Where’s the Beef” rap song, for example. I still enjoy the silly records that don’t hold a lot of value other than giving you a smile when you put them on. What are the records that are still eluding you? Do you think there is an end point to collecting? Some people will swear they’ve seen records from wrestlers that I’m fairly certain don’t exist. Like Bruiser Brody and Road Warriors picture discs, for example. I guess I like to imagine there are some crazy records out there that I haven’t heard yet. Get Mind Games delivered to your inbox. Subscribe!